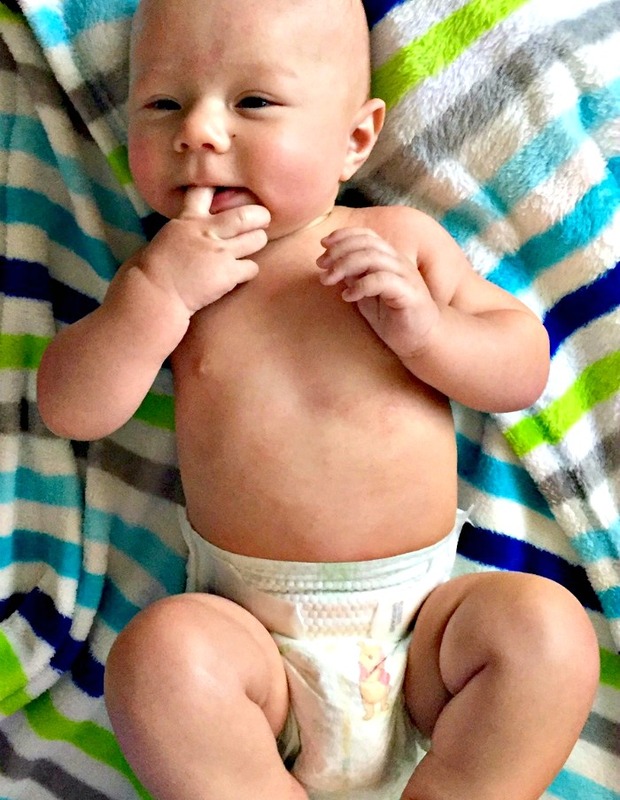 When my baby was born, I was prepared for what might happen to my baby’s beautiful soft skin–first the dreaded “baby acne” followed by some possible cradle cap. It happened with our second, so I knew it might be a possibility. Baby eczema wasn’t even a part of my vocabulary. 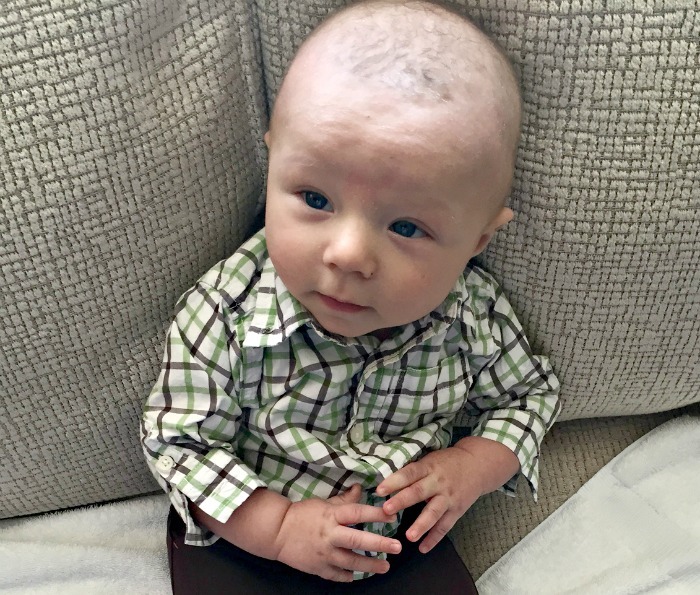 I wasn’t prepared for it and what it did to my sweet newborn. Let me first say that I am all about natural remedies. My doctor then gave me a special shampoo to try. This also wasn’t working and at this point we were getting ready to leave for a trip and I didn’t have time to set up another appointment with my doctor and possibly wait for week to get in to see him. 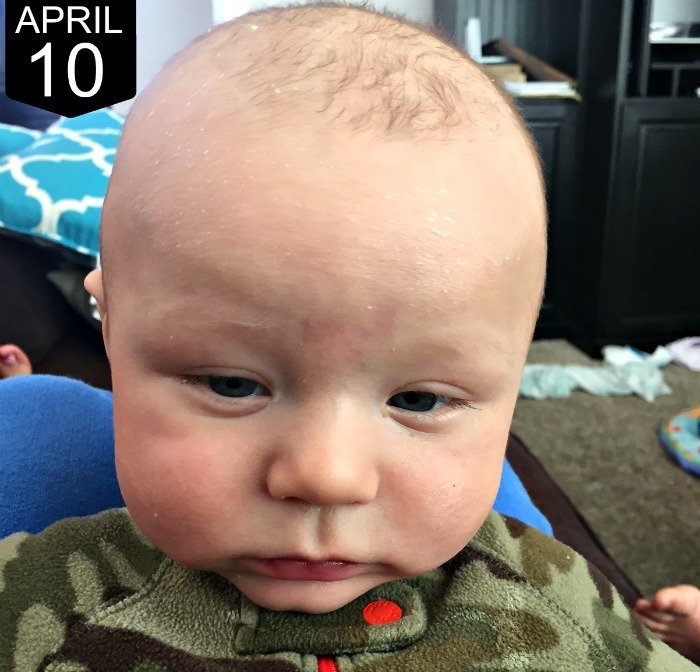 The “rash” was starting to spread to his cheeks and I wondered if he might possibly have something other than Cradle Cap. Luckily, I knew about a health platform called AZOVA, where I could ask a dermatologist a question, without having to live nearby, and without having to leave my house. 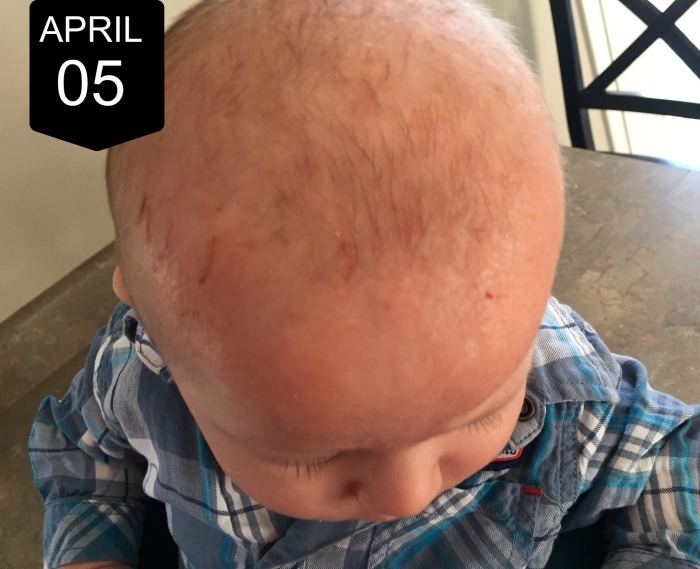 I knew about Dr. Eberting and her expertise with various skin conditions, so I set up a quick consult online and submitted pictures of my son’s head. 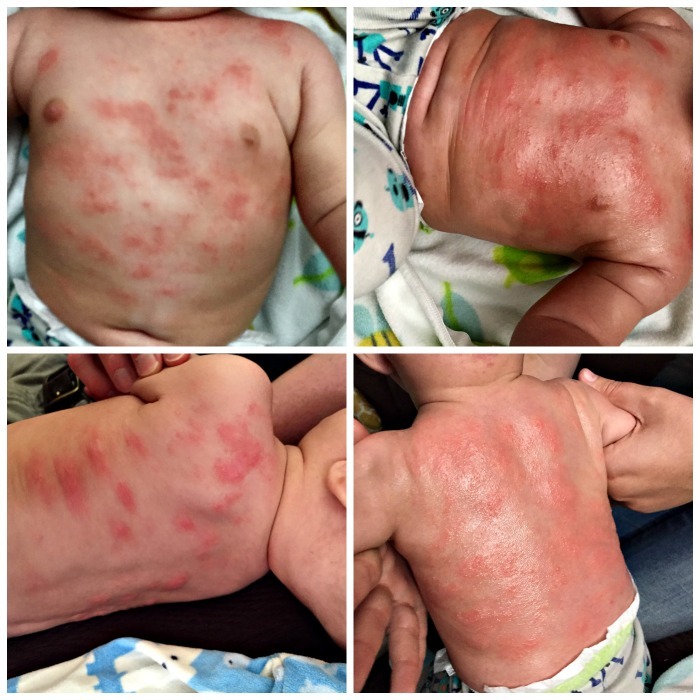 She then called me on the phone, said it looked like eczema to her, and advised that I try the TruLipids Eczema kit (I have never seen Eczema on babies like this before). 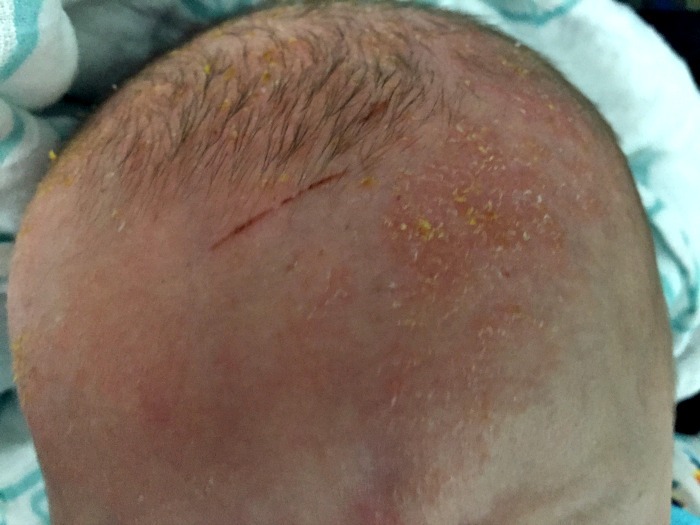 By this point, this is what my son’s head had progressed to by the time I had the cream to put on: Baby eczema is so sad!! This is what it looked like after 24 hrs, WHAT?? Amazing!! and here’s my infant’s eczema on day 5 on the cream: Almost all cleared up and worry I was able to let go! 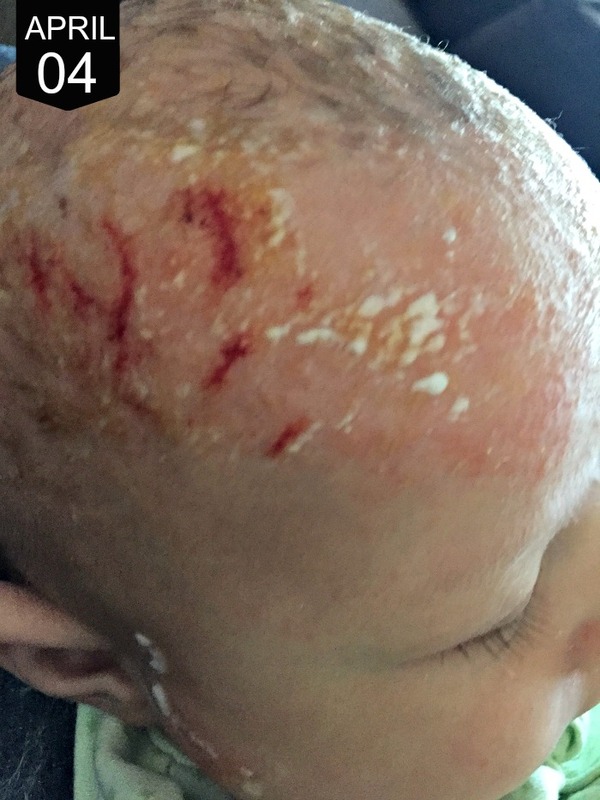 Eczema is horrible in general, but baby eczema is extra heartbreaking to see! There was still just a tiny bit of it left 3 days later, but the inflammation and redness was entirely gone! I was SO IMPRESSED with this cream. And mostly, I was grateful about the ingredients. I hate using prescriptions and drugs and anything with toxic ingredients when I don’t have to. It has been such a perfect solution for me for treating eczema on babies without harsh chemicals. It has been such a relief that I had already heard about it through my friend, so I was already open to it. I link to my friend’s experience at the end of my story if you would like to read hers as well. The con is the price, but I love that they have a 30-day guarantee. So if it ended up not being eczema after all, it can be returned for full money back as long as the tubes are still half full. But honestly, I was looking over all the skin conditions that these creams treat, and even if it hadn’t been eczema, it might have still done the trick! I also love that it lasts a long time on babies because they have smaller areas to treat. 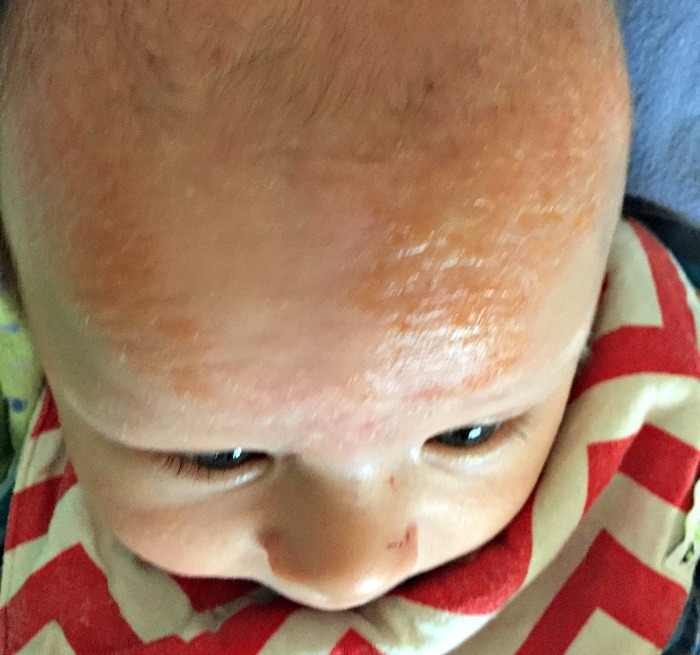 ANOTHER THOUGHT about baby eczema…..
As I’ve read other blog posts on eczema and some of the comments people leave, I feel like I also need to add something else about my experience. Many people will say, “eczema is a dietary thing!” “You just need to eliminate this, or that!” Some people will say “It’s allergens in the air, you just need to stay indoors.” While others said, “It’s a chemical thing, you just need to switch over to this shampoo, and this laundry detergent.” The list goes on. I used a natural shampoo, I eliminated dairy, I eliminated sugar, and I even paid over $400 for allergy treatments on both my son and I. I did all of this while also experiencing some postpartum depression. I’m a total cheerleader for natural products and a healthy diet, and yes, definitely try those things! But the last thing an exhausted new mom needs to hear is that she needs to try ONE MORE dietary experiment on top of what she is already experiencing. I’m in tears just thinking about the state of exhaustion I was in. I’m just happy to finally have his eczema under control! 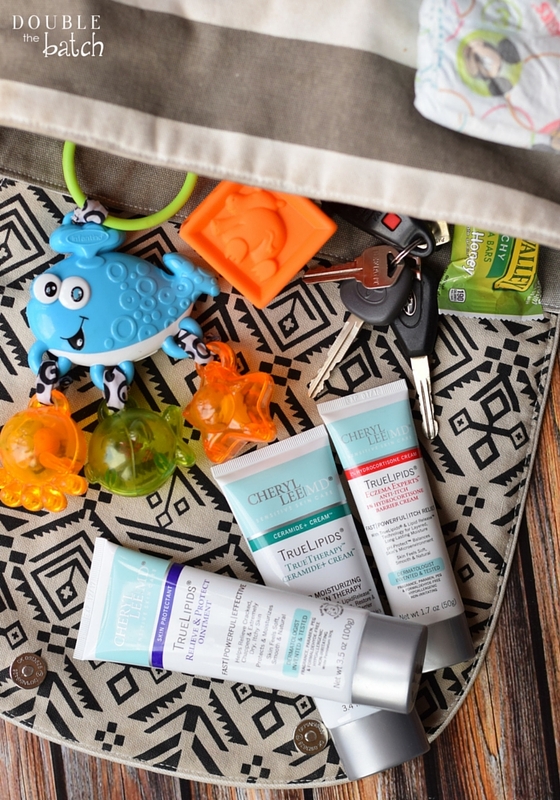 I am grateful to have an amazing product, free of toxins, to help when my baby’s skin flares up. I’m happy that I can go into public and know that other people are loving on my baby’s infectious smile rather than being distracted by his head and wondering what’s wrong with it. I share my experience in hopes that another desperate mom out there finds the same relief that I have! 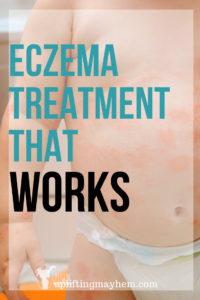 If you want to learn more about why these products work so well for eczema, read here. I received a free consult on the AZOVA platform free of charge in exchange for an honest review.